Kirby is back in an even more colorful adventure. However, this is not a brand new game. In fact, there is a port of the Wii game called Kirby's Epic Yarn - a game launched in 2011. In other words, it is a game that is over eight years old. Moreover, this is probably one of the very latest top games for 3DS, if not the very last. Kirby's Epic Yarn was launched to Wii around the same time as 3DS was launched. Nintendo's conclusion to the 3DS adventure is, therefore, a bit special. The story is set to a textual value where everything consists of… yes, textiles, buttons, and zippers. This also includes the main character, Kirby, and all the creatures that Kirby meets along the way. The reason why Kirby, the world and the other characters consist of textiles, is that Kirby has been sent to Patch Land. As the name suggests, this is a country that consists of, yes, textiles. Here, Kirby is commissioned by Patch Land's head, Prince Fluff, to save the country from the evil Yin Yarn's claws. To do this, Kirby must sew the seven parts of the country together using magical yarn, and such yarns get Kirby only by defeating the various bosses that are to be found in each of Patch Land's parts. That all living characters consist of yarn threads is, in my eyes, a genius stretch. Especially considering how easy it is to transform yarn threads. Taking Kirby's fairly resilient character into account, it becomes obvious that the design selection fits the main character like a glove. In previous games in the series, Kirby has been able to turn into other characters by eating them up. Because Kirby now consists of yarn thread, he does not have the opportunity to eat others anymore. This, however, does not prevent Kirby from transforming himself - and consequently, players will be able to see the main character being transformed into a submarine, to a car, to a UFO, to a tank - yes, the game designers have not withheld. The other characters of the game are as varied as Kirby himself. The bosses give a "bossy" impression, and this despite the fact that they consist of yarn threads. The only negative with the bosses is that they are somewhat easy to fight. This also seems to be the game's biggest problem. The paths are beautiful to look at and it seems to have put a lot of work into them. However, it quickly becomes very easy. This is what developers have tried to solve by including a more difficult mode called "Devilish Mode". If you choose this mode, one of the last boss's subjects will appear in time and out to attack you. However, these are not difficult to break and appear more of an annoyance than a real challenge. More challenging is perhaps to find all the secret objects that are hidden around the different boards. In other words, if you are a gamer who must complete all the games 100 percent, you stand in front of a slightly larger task. The sound and music in the game can be briefly described as sweet sugar. In my opinion, it might be pretty much sweet at times. Classic melodies and sounds from Kirby's Dream Land (GameBoy game from 1992) can be found in the game. This can probably lead to something nostalgic for older players. However, I do not think the music in the game is impressive. The Kirby series is a game series I connect with relatively good soundtracks, but this game is an exception. In addition to the Devilish Mode, the developers have also added two new mini-games that were not in the Wii version. These are called Dedede Gogogo and Slash & Bead. The mini-games only have four boards each, and you play through them in minutes. It is fun to be able to play as King Dedede and Meta Knight, but the mini-games appear most like something that is OK to play if you want to pause from the game's main mode. The strength of the game is its control set. You don't spend a long time understanding how to control Kirby, and this is especially positive for younger players. I did not experience the only time I could blame poor controls for not being able to jump to a platform (which happened relatively rarely). 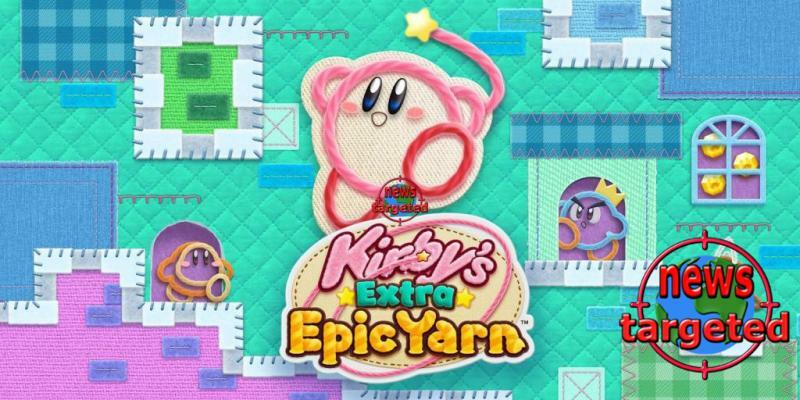 Kirby’s Extra Epic Yarn is therefore well suited to younger players who are even introduced to the game world's many pleasures. However, I am unsure whether the game will bring much joy and challenge to more experienced players. Kirby's Extra Epic Yarn appears as a true copy of the Wii version. The little extra that has been added does not justify a new purchase for those who have already played the original. Those who like the Kirby series will no doubt have several hours of fun in front of them, but it will hardly be particularly challenging. Younger and more inexperienced players will probably like the game at their best, and looking for a game that you can use to introduce someone to the game world, this is one of the games you should bet on.